♠ In other words, the Central Government and the State Governments are going to be empowered to levy & collect GST on supply of shares & securities!!!! The levy of even 1% GST on sale/supply of securities may create havoc on the share markets. ♠ In the current taxation regime, ‘securities’ is specifically excluded from the definition of ‘goods’ as defined in Section 2(21) of Odisha VAT Act, 2004 and in all other state VAT Acts so as to keep it outside the scope of levy of VAT itself. Interestingly, ‘securities’ are included in the definition of ‘goods’ in Section 65B(25) of the Finance Act, 1994 so that there is no levy of service tax on the same (because trading of goods is in the Negative List) and apparently this definition has been imported in the GST Law, which needs immediate attention. 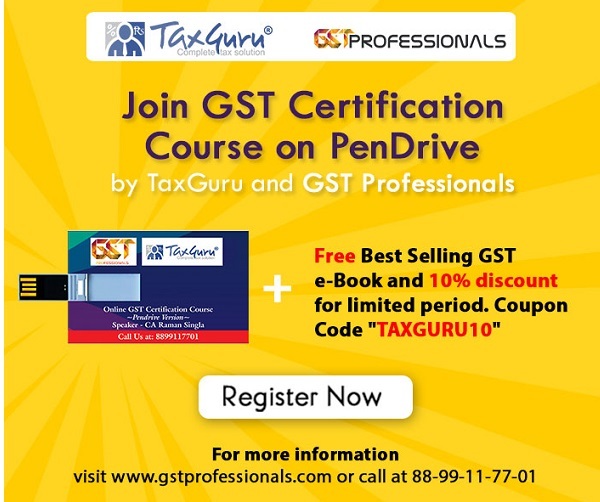 ♠ Therefore, given the enormous volume and significance of stock markets in Indian Economy, the wide powers proposed to bestow upon oneself by the Central and State Governments should be restricted by omitting the word ‘securities’ from Section 2(48) of Model GST Law so that it REMAINS excluded from the definition of ‘goods’. Also, the term ‘services’ as defined under Section 2(88) should exclude ‘securities’ by way of Explanation as done in case of ‘money’. The Stock Market industry should come together to ensure that there is no power vested with the Government to levy tax on sale/supply of securities, commodities and derivatives in any manner. ♠ I believe that there may not be any immediate intention of the Government to levy GST on Shares/Securities and therefore I am of the view that the power itself should not be there in the GST Act for the time being. In future, if the need for such levy is felt, the same should be done by making necessary amendment in the law after thorough discussion, research & analysis with the stakeholders and with direct approval of the Parliament in this regard. Disclaimer: This article is the property of the author. No one shall publish, copy, reproduce or use it in any manner, for any purposes (except for personal, non-commercial use) without the written permission of the author provided that it can be shared with due credit to the writer. The author shall not be responsible or liable for anything done or omitted to be done on the basis of this article. The purpose of including securities under goods isto exclude it from services. there will be specific exemption for securities no need to worry.